Clematis is part of a brand new mini series within our mohair collection this year which are named after flowers, this gorgeous new trio look stunning together or as stand alone pieces. Clematis is our first in the series and has been created using the finest Schulte mohair in soft petal pinks and cobweb creams. She has oversized sculptured paw pads, deep set glass eyes and a hand embroidered nose with additional airbrushing detailing. She has been handmade like all of our Charlie Bears using all the traditional age old techniques in bear creation. She wears both an organza ribbon head bow with ceramic jewellery detail and a shoelace necklace with a bumble bee pendant. Clematis is fully jointed and an adults collectors bear so recommended for collectors aged 14 years and above. 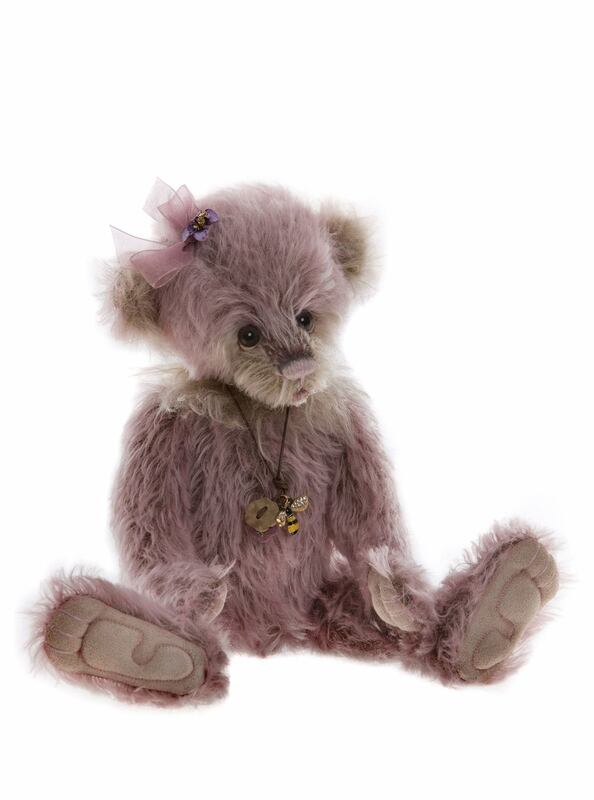 She is a numbered limited edition bear to only 300 pieces worldwide and will arrive with a bespoke collectors canvas bag. Her two sisters who complete this years set are called Celandine and Shamrock so be sure to look out for these if like Charlie you have fallen in love with these little ones.